The Disneyland Resort is more than just home to the magical Sleeping Beauty Castle. Disney is a walk back in time as you travel to the 1950s when the park was formally built. The architecture is as varied and timeless as it is a classic reproduction of the original. Disneyland is a diverse community of the best that Southern California has to offer from amusement park rides and scenic attractions to high-end urban shopping. Disneyland Park is full of enigmatic sights from Main Street to Adventureland, but you don’t have to book within the expensive travel resort destination in order to enjoy all that Disneyland has to offer. In fact, planning your stay outside of the park can make the family trip all the more affordable and worthwhile for the whole family. Traveling to or around the resort and hotel can be a maze within itself, even with a Disney Park map on hand. Your family may decide that it is more convenient to rent a personal bus for the entirety of the trip than to tackle pesky parking fees or crowded public transit routes during peak travel seasons. With a private bus, your local driver will navigate the area better than anyone while providing suggestions during your stay. When flying to Disneyland Park, travelers can either fly into Los Angeles International Airport (LAX) if they are looking for a larger selection or land at John Wayne Airport for a more affordable flight. Most travelers, however, choose to take a direct flight into LAX, since it is about a 50-minute drive to all of the most popular hotels near Disneyland. For the Disneyland Express, a one-way ticket ranges from around $20 to $30 per person. At this rate, a group of 56 passengers would pay around $1,400 total. On the other hand, a rental by GOGO Charters from the LAX airport would cost about $750 for a full-sized 56–person charter bus round-trip. In addition, if you have a group of 56 people, the cost averages out to a rate of only $13.50 per person. Keep in mind that the more people you have in your group, the more affordable the bus will be per person, making traveling in a larger group is the most economical travel method. With a charter bus rental, you are provided with a luxury bus, which guarantees a safe and private ride. A shuttle rental is the best option for group excursions if you are looking for a round-trip bus service with an overnight stay and flexible travel hours as you travel to and around Disneyland. GOGO Charters can provide you with more affordable luxury transportation options from any airport, which will allow you to entertain the kids with games and movies on the go during long extensive road trips. The Disneyland Park Resort is located in the Downtown Disney District in Anaheim, California near a myriad of local attractions. Make a reservation in the South East or North Anaheim perimeter for the most affordable stay nestled near a variety of neighboring California adventures, such as Universal Studios Hollywood, SeaWorld, Knott’s Berry Farm, the San Diego Zoo, and Six Flags in Los Angeles. Planning a shuttle bus rental to take you to and from any resort is far more cost-effective, while also consolidating your group of family or friends to escape the Disneyland crowds. Parking at the Disneyland resort can get expensive and time-consuming by the time you commute, find a parking spot, and catch another shuttle to the park. A charter bus rental is the fastest and most affordable way to get you to and from the resort or your hotel. When you book a charter bus you are able to plan your own itinerary. That way, you can visit your favorite local stops while the bus runs on your own time, not theirs. 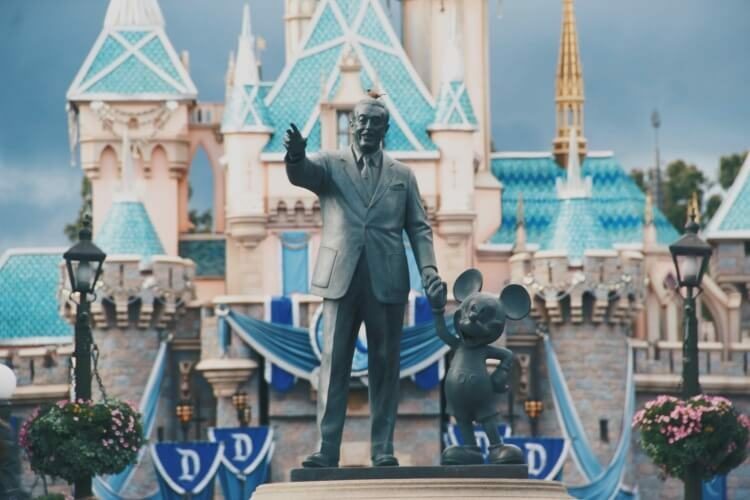 Make certain you get the transportation you’re looking for by booking a charter bus that makes several stops in Anaheim as well as all the Disney hotels. Plan your trip with a local driver familiar with the resort. Finding Anaheim hotels near Disneyland can be a challenge and a weight in your pocket. Many travelers are now transferring over to more affordable hotels located outside of the resort and are finding more practical transit options to commute by a group. Hotel shuttles only run every couple of hours and trolleys run every 20 minutes on a complicated bus schedule, while also being less feasible for weekend drives. Most experienced families choose to avoid parking at Disney with their own car and instead commute by bus to the resort so that a ride is always available before pickup. Figuring out where to stay inside or outside of Disneyland is simple when you have so many options, but transportation is another story. Example: Wondering how much it might cost to stay in the park versus the cost of staying outside the perimeter and commuting to the resort? For four people staying in a Disney Hotel, their total would cost an average of $200 per person for each night at approximately $3,200. For five people that adds up to about $400 a night to stay at Disneyland. But if you stay outside of the perimeter, the cost will be about a fourth of the amount priced at $100-$120 a night. If you plan to have a bus throughout your week, don’t forget to provide lodging for your bus driver. Find the hotel that provides discounted room and board for your personal bus driver if you’re going to use a bus service for the full length of the trip. If you need a bus for overnight travel, an important factor is to develop a hotel parking plan to ensure you can save money on parking. Overnight bus drivers will provide you with more leeway on traveling to local attractions inside and outside of the park. Walt Disney’s original Disneyland theme park first opened on July 17, 1955, and is divided into eight theme parks and attractions; Main Street U.S.A, Tomorrowland, Fantasyland, Frontierland, Mickey’s Toontown, Critter Country, New Orleans Square, and Adventureland. Your driver will be available at your leisure for pickup and drop-off. If you’re looking for things to do within the Disneyland resort, explore the newest of Disneyland additions; Buena Vista Street and the California Adventure Park. While searching outside of the perimeter, keep in mind that Anaheim, California is located nearby many Los Angeles attractions such as the House of Blues in Anaheim. You may also walk from Downtown Disney to the nearby Garden Walk mall. Angel Stadium of Anaheim: Visit the baseball stadium for the Angels experience of a lifetime. Baseball fans can take in the game at Angels Stadium and go home with a souvenir photo next to the iconic giant Angels baseball caps at the entrance of the park. Knott’s Berry Farm: Explore Knott’s Berry Farm, another well known California amusement park. Outlets at Orange: Shop at the outlets in Anaheim for the full shopping experience. Knock your trip out of the park by pre-arranging a guaranteed shuttle service to take you to the most popular event destinations near the Disneyland California Resort. Book your hotel close-by trendy local attractions, entertainment events, tours, and dining in the Anaheim area. Schedule a bus to transport you to and from the theme park throughout your stay! Travel in and around Anaheim with ease as you explore your favorite tourist destinations. If you want to know your charter bus rental price according to the time of year, the number of passengers, or type of bus rental, call our travel consultants at 1-855-826-6770 for a personalized quote on your shuttle service today.